GiveNow - Filling the Spaghetti bowl! Spaghetti Circus is an innovative not-for-profit regional youth circus and performing arts organisation. We aim to be one of the Best Regional Youth Circuses in the World! We make fun shows for a variety of venues including our very own Big Top, and we specialise in engaged participants and audiences. Spaghetti Circus is an icon of Mullumbimby and the Northern Rivers of NSW and we are owned and loved by our whole community. 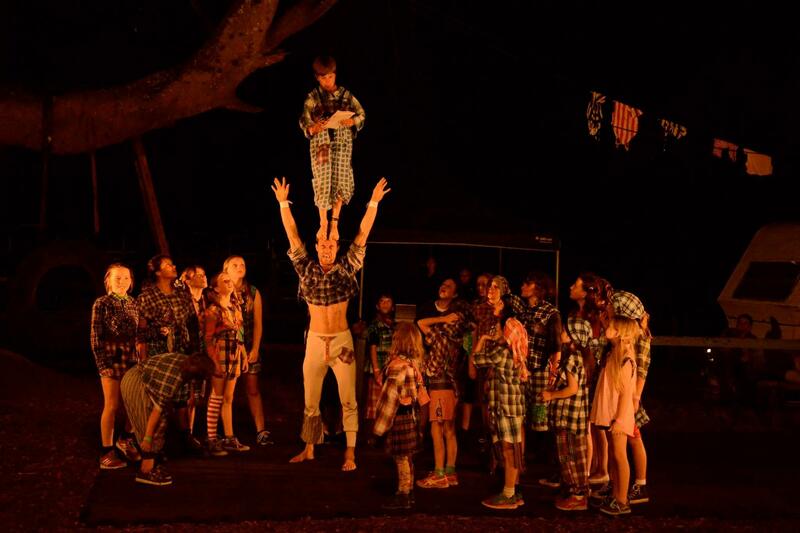 We are tucked away in our sheds out at the beautiful Mullumbimby Showground, so you might not have noticed what we’re up to, but every year thousands are captivated and empowered by our training programs and performances. We depend on the love and dedication of our staff, coaches, families and community volunteers, all of whom constantly give above and beyond the call of duty. We care about including everyone who wants to participate so we aim to keep our fees and costs as low as possible. As a result there are always limits to what we can achieve on our very tight budgets. We’re definitely not limited by our vision, but sometimes we’re limited by what we can afford! Here’s where you come in! You can help us. We are asking for your financial support to produce our inspiring performances and to provide a safe environment, professional training and opportunities to build the skills and confidence of many more people, young and old. All it takes is an end of financial year tax deductible donation, big or small! Every single donation helps! With so much leaping, landing, tumbling and twisting our circus equipment takes a serious beating! To maintain our high safety standards, we need around $10,000 worth of maintenance, repairs and new equipment every year. In 2018 this will include: a new crashmat, wall bars for stretching on, $1000 worth of schools and workshop equipment, flyway ends for our big trampoline and a $5000 modified trailer for taking workshop equipment on our outreach projects. To raise Spaghetti’s visibility in the region we want to put big matching Spaghetti signage on our new bus, truck and trailer. We tour frequently each year. This includes our popular tour to aged care facilities and preschools. It’s a powerful intergenerational connection that helps bond our whole all-ages region together. We don’t charge the aged care centers for our shows and your donations will help to make it possible to continue this wonderful tradition. We believe everyone should experience the joy of circus. To help some of the amazing families who make Spaghetti Circus what it is, we provide assisted training program and scholarships to selected students. Your help will allow us to expand this worthwhile program. Our coaches and staff benefit from circus industry workshops, training programs and skill-sharing opportunities. Ensuring their skills are up-to-date continuously improves the quality of teaching and the safety of our students, however these activities and master trainers are almost always outside our small town. You can help meet the necessary travel and accommodation costs of this upskilling. adaptations to the back shed to extend the Tramp Wall area. These last projects are maybe still a few years off – but we love to dream, because so far our dreams have a habit of coming true!! As long as it’s over $2, literally as much as you like! Will it actually make a difference?